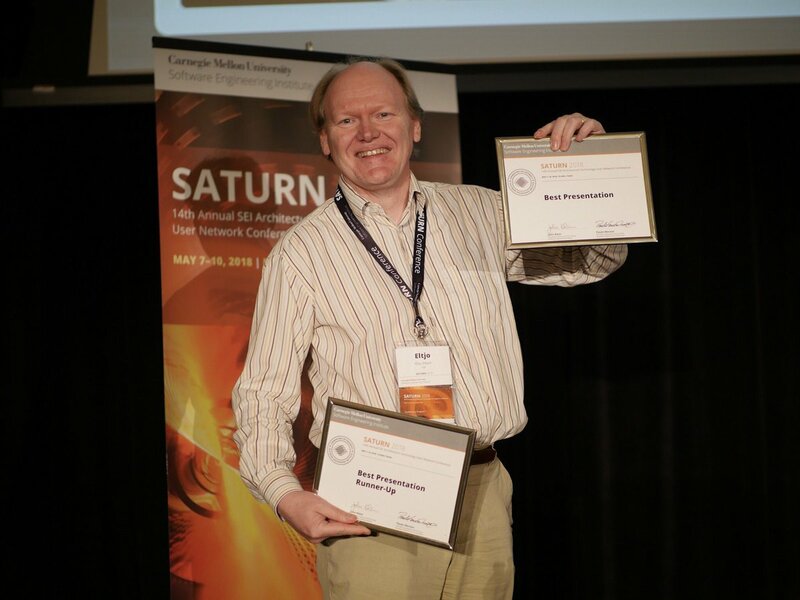 The annual SATURN conference is usually one of the highlights of my professional year, and SATURN 2018 was no exception. This year’s edition took place in Plano, TX, and presented another jam-packed cornucopia of digital architectural knowledge in four parallel tracks over four days. Don’t be sad if you’ve missed it: all sessions have been recorded and will be posted to the SATURN playlist on YouTube. I will certainly check back there to see some of the talks I had to miss – because there was just too much going on in the parallell tracks..
Monday was warming-up day with full-day training sessions and a workshop on “growing great designers”. I attended the workhop, in which we discussed how to select and train designers and architects – but also how to get organizations to care about good design. It was interesting to brainstorm the essential “canon of knowledge” about software design, which made us realize that the paradigm of architecture as a set of design decisions is still not as accessible as we would like: there are great books and established training curricula about many other design paradigms, such as patterns, modeling and many architectural styles – but if someone asks “How do I put the idea of architecture as a risk-driven decision making discipline in practice?”, there’s no easy answer yet (although George Fairbanks’ “Just Enough Software Architecture” comes close, as does the RCDA training program). The workshop outcome can be found on github. The conference proper took off with a keynote on evolutionary architecture by Rebecca Parsons of ThoughtWorks. She introduced the idea of an “Architectural fitness function” to describe how close an architecture is to its desired characteristics. Measuring the function over time would enable us to monitor architectural quality during an architecture’s evolution. Extending quality attribute scenarios with temporal behaviour? In the afternoon, we played the Smart Decisions Game – a fun way to introduce people to the idea of making architectural trade-offs based on quality attribute requirements. The task was to select machine learning algorithms for a specific context, and we each received a deck of cards. Each card summarized an architectural choice (an algorithm), including its impact on quality attributes. The game was extremely well prepared by the guys from SoftServe and Rick Kazman. and I was especially impressed by the ease with which we could plug these algorithms into their toolbox. Wednesday’s keynote by Ricardo Valerdi was a fascinating journey into the world of Virtual Reality. Ricardo told the story of the development of an app for creating concussion awareness among football players. It was a nice bridge between architecture and user experience, which becomes ever more important as an architectual concern. Michael Keeling then presented a very practical (as always) lesson on managing technical debt. In the afternoon, I talked about Shortening the architectural feedback loop – an extended version of my blog post with the same name. We had nice discussions, and this talk was voted runner-up for the best presentation award. [edit: watch the talk on the SEI YouTube channel]. The other highlight of the afternoon was a nice talk by Sebastian von Conrad, about applying the concepts of Douglas Hubbard’s “How to measure anything” to quality attribute quantification. The final day started with an amusing game of slide roulette (a lot of fun, but why schedule it at 9AM??? ), after which Linda Northrop Award winner Eoin Woods gave a very nice acceptance keynote, describing the Five Ages of software architecture, and his outlook for the coming age of “Dissolving systems”. After two interesting GDPR-related talks by David Max and Andrzej Knafel, it was time for the Ethical Software Architect workshop that I had prepared with Michael Keeling. [edit: watch the session on the SEI YouTube channel]. We looked at some examples of ethical impact of architectural decisions in news headlines, and at some reasoning frameworks architects can use when they are confronted with ethical dilemmas. We then split up in groups to discuss fictitious scenarios that any architect could sooner or later encounter. These discussions became so lively that we got some complaints from jealous speakers in neighboring rooms afterwards! The attendants were so happy with this session that they voted it number 1 for this year’s best presentation award – which says a lot about how architects feel about ethical aspects of their work. There seems to be a real need for more ethical guidance for architects in the digital world, and I would be surprised if it wouldn’t become a regular topic in architecture conferences the coming years. coordinated), Semantic Coupling (Change together because of shared concepts), Functional Coupling (Change together because of shared responsibility) and Incidental Coupling (Change together for no good reason). These musings reminded the “elderly” among us of work done in the 70s and 80s about modularity and the birth of object orientation, but it was nice to see these design fundamentals expressed anew by someone who has great impact on modern views of software engineering management. All in all, the conference left me feeling very fulfilled and inspired (and not just because of the nice recognition I received from the attendants’ rating of my sessions). This entry was posted in Conferences on 18 May 2018 by admin.